I don’t know about you, but one of my favorite things about this time of year is Christmas candy and allllllll kinds of Christmas themed desserts. I’ll be the first to admit that I have a major, and I mean, MAJOR sweet tooth! So I decided I needed to get things moving along in the dessert-making department! 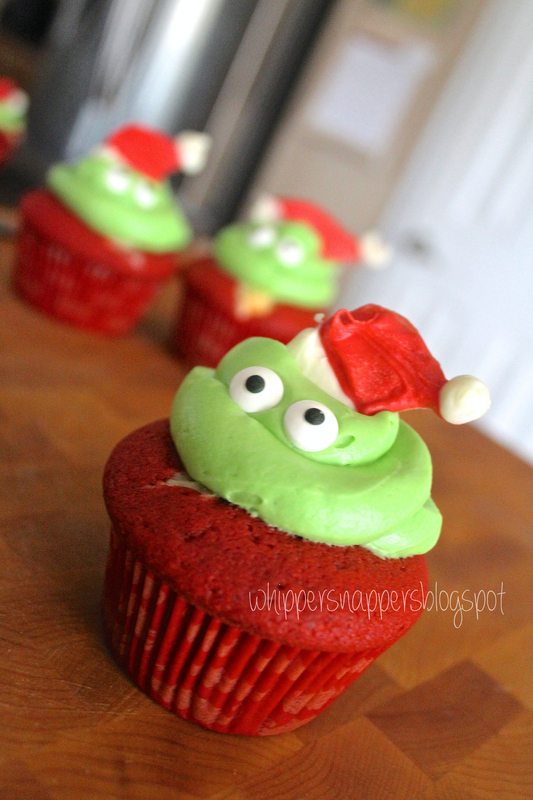 Better yet…cupcakes! Who doesn’t like cupcakes?! I am very thankful that my husband works with a ton of guys who can take all of the extras off my hands. I am always baking up new things and sending them off to work with him. If it weren’t for that, I would probably have to stop baking because I would eat it all myself! It doesn’t matter if I hide it away in a container, wrap it up and freeze it…doesn’t matter. I WILL know that it is there and ultimately decide that I have to have it. I’m not really all too great at actually coming up with dessert recipes myself so I actually combined a couple of ideas that I found from a couple of other talented people! 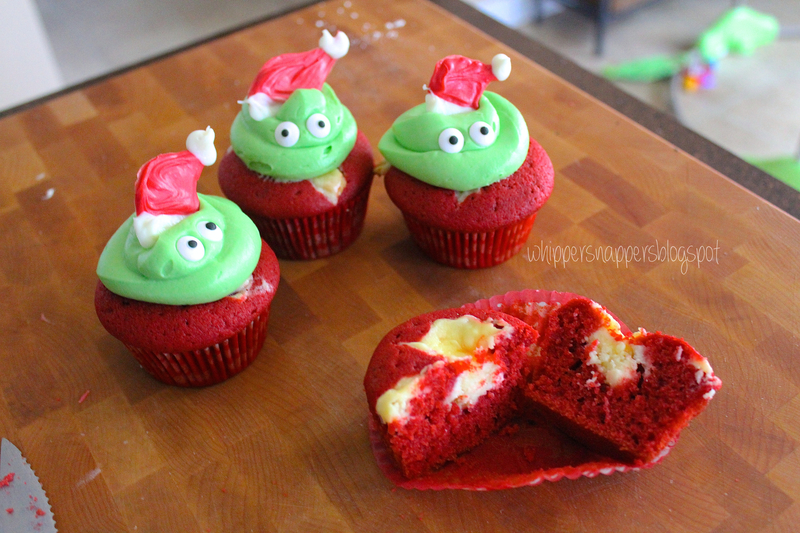 I saw the most amazing Grinch cupcakes on pinterest and wanted to do something similar. The original cupcakes came from Sugar Swings blog, to check out their recipe click here. They did theirs with peppermint, which is also an amazing idea! Also, check out the heart they added in the middle!! 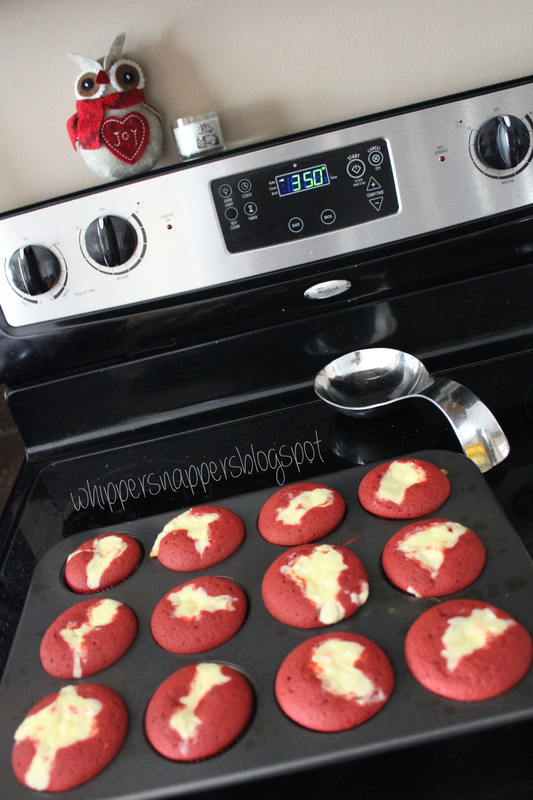 I decided to go a different route with mine with…red velvet! Doesn’t get much better than that right? Wrong! Add cheesecake and cream cheese icing and you have perfection! I used a cheesecake filled red velvet cupcake recipe from Sweet Little Detail’s blog. 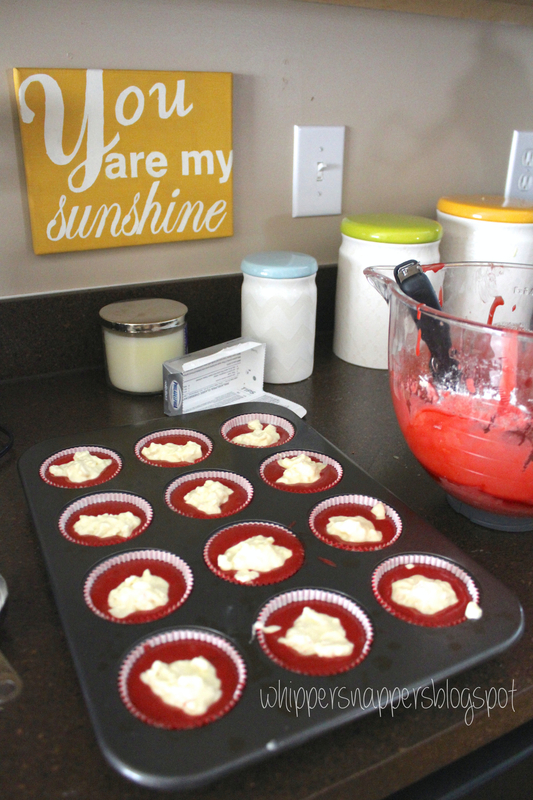 Check out the recipe they used for their Surprise Red Velvet Cupcakes. First, make the cheesecake filling to set aside so that it is ready. Blend the cream cheese, egg and sugar in a bowl until very smooth, then stir in the white chocolate chips. Set this aside until later. Line cupcake pan with cupcake liners or spray with nonstick spray. Whisk eggs in a bowl, add remaining liquid ingredients, mix and set aside. 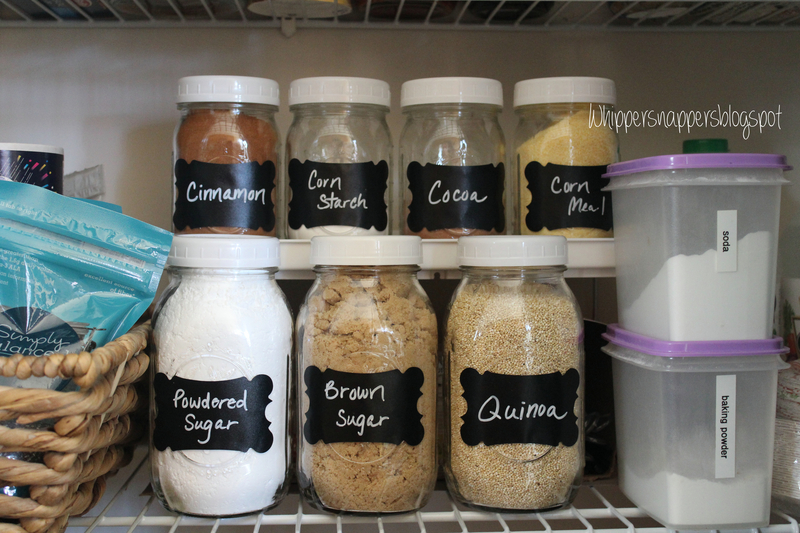 Mix all dry ingredients together in a separate bowl. Add the liquid ingredients to the dry ingredients and mix until combined. Fill pan with batter about 2/3 full and then top with a spoonful of the cheesecake mixture. I filled mine very full and they turned out great! I pushed my spoonful of cheesecake mixture down into the batter a bit with a knife. Bake for 20-25 minutes. Let cool completely. Now for the frosting! I usually just guesstimate the amounts until I get the consistency I want but the amounts I used this time for this frosting turned out amazing! 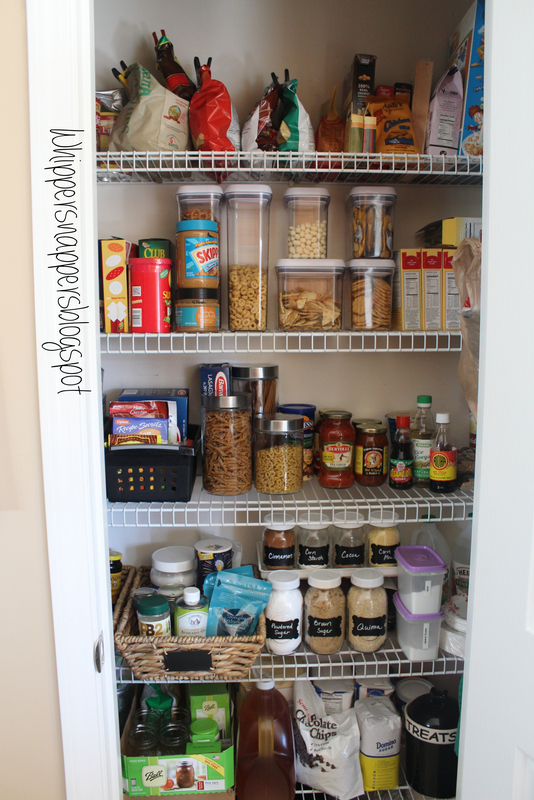 I was disappointed that I didn’t have much leftover to devour but it is probably for the best! Beat cream cheese and butter well until creamy. Add vanilla. Add powdered sugar little by little until you get the consistency that you want. 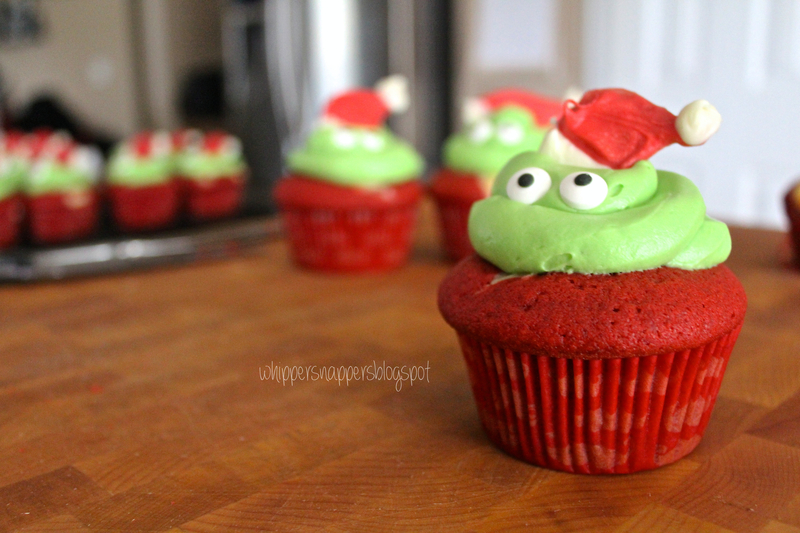 I then added green food coloring to make my Grinch cupcakes! But you could leave it white or do whatever you so choose to fit whatever theme you are trying to do. …and Ta Da!! 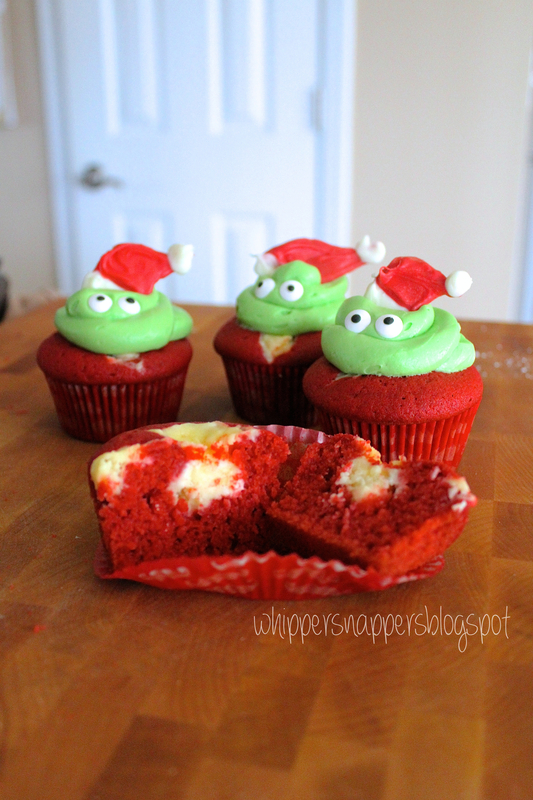 Those are my Cheesecake Red Velvet Grinch cupcakes! I just iced them thick with frosting, added edible eyes and made white chocolate santa hats! You could do any design you want this way. Just melt white chocolate in the microwave and add a bit of food coloring to it. 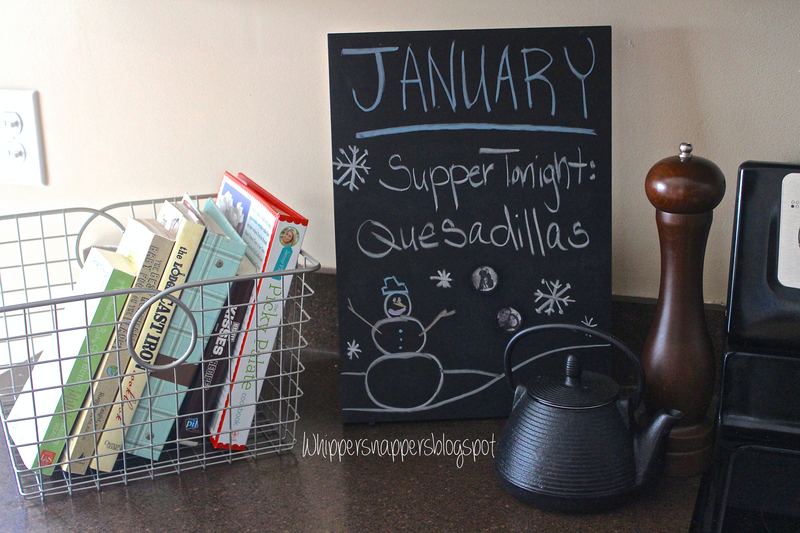 I then piped it onto wax paper in the shape of santa hats and put it in the freezer to set. My son had a lot of fun “helping” me with these cupcakes! 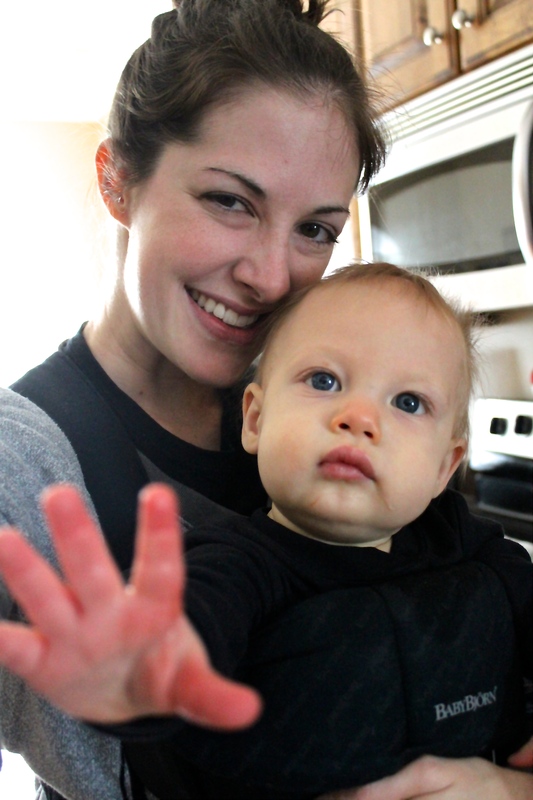 Aka putting his hands in the BRIGHT red batter without me realizing it and getting it everywhere! 😛 He sure has fun watching me though and that’s all that matters. 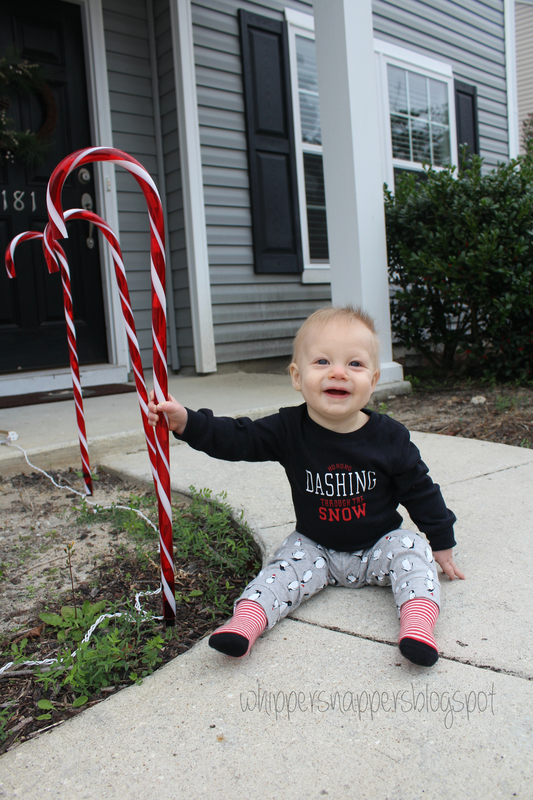 Have fun with your holiday baking!